On July 21st, AMDA continued to provide support to the evacuees in Soja City and Mabi Town through the unbearable heat. In addition, AMDA dispatched a lawyer to Okada Elementary School who provided legal advice, and doctors, nurses and coordinators to the newly-reopened Mabi Memorial Hospital, which was forced to close due to the flooding. 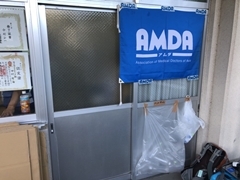 AMDA also received personnel support from Kuroshio Town, Kochi Prefecture, a registered member municipality of AMDA’s Platform for the Great Nankai Trough Disaster in Japan, and a support group known as Okayama Co-op. On July 20th, there were 54 evacuees at Sunwork Soja. 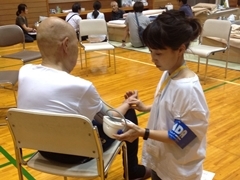 AMDA continued its Health Support Program and treated around 10 people. In cooperation with a Soja City Public Health Nurse, an AMDA nurse and coordinator watched over the evacuees, providing dietary and hygiene advice, health consultation, general assistance and urging them to exercise. The AMDA nurse took one elderly evacuee, who was unable to continue cleaning his house on this day, for a walk around the building for a few minutes. Although it was hot, being able to spend some time outside made a good change of pace. There are many families living in the same gym hall without any partitions for privacy. Although there is air conditioning in the hall, the affected areas are uneven, and caution is required. On one hand, some parts are largely unaffected, and some are at risk of heat stroke. On the other hand, there are areas that get too much wind and those there are at risk of catching colds. 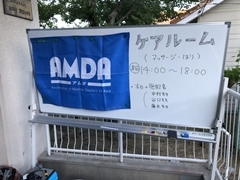 The AMDA team spent the morning of the 20th July relocating from Okada Nursery School to the ‘Himawari’ class room in Okada Elementary School. As Okada Nursery School was to reopen to its children, AMDA was unable to continue using the room there. While the team was setting up the new room, the masseuse gave massages to six people around the school. The relocation finished by noon, and the newly-named ‘AMDA Care Room’ was ready to again provide massages and acupuncture treatment to the evacuees. Throughout the rest of the day, seven people received massages and eight received acupuncture treatment. From carrying out their activities, the AMDA staff have felt that the evacuees are losing their spirit. They have now been evacuating for two weeks and it has taken its toll, both physically and mentally. Many of them are unable to sleep well at night. Even the children are fatigued. AMDA hopes that the massage and acupuncture treatments are helping to relieve the evacuees of their exhaustion.